A monthly live jazz night for local musicians and jazz-appreciators launched last month in Greenpoint hosted by keyboardist Jesse Lynch. The second session happens on Wednesday, March 20th, at Warsaw (261 Driggs Ave.) from 9 p.m. – 12 a.m.
Lynch, a Greenpoint-based pianist began hosting live jazz sessions at a Greenpoint loft last year under the name Brooklyn Vortex. 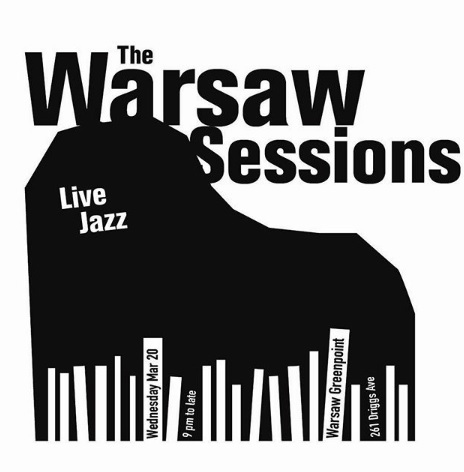 With the Warsaw Series, he hopes to bring together local jazz players to exercise their improv skills. Lynch will put together a different house quartet every month with drums, bass, horns, and keyboard. The house band will play for the first hour with originals and standards followed by an open session for guest musicians who show up. The house quartet this Wednesday features Stan Killian on tenor sax, Alex Ritz on drums, Joe Michaels on bass and Lynch on the keyboard.